The letters of Hilda Dajč , offer a rare and moving insight into the conditions at the Semlin Judenlager in Belgrade between December 1941 and May 1942. Hilda Dajč was born in 1922 to an affluent Ashkenazi family which included her parents, Emil and Augusta, and younger brother Hans. Before the war, having graduated from High School as one of the top students of her generation, Hilda enrolled to study architecture at the University of Belgrade. 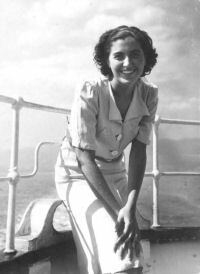 After her studies were interrupted by the invasion of Yugoslavia by Nazi Germany in April 1941, Hilda volunteered as a nurse at the Jewish hospital in Belgrade. In the early months of the occupation, Hilda's father, Emil Dajč took on the role of vice president of the Vertretung der Judischen Gemainchaft, the Representative Body of the Jewish Community in Belgrade. This organisation, established by the Nazis, took over the affairs of the community from various Jewish communal bodies, charities and other institutions which operated before the war, and which were closed down by the occupiers. Because of Emil Dajč's involvement with the Representative Body in the initial stages of the occupation Hilda's family was unaffected by many of the harsh antisemitic measures and policies to which other Jews in Belgrade were subjected at the time. In December 1941, after most of the country's male Jewish population was killed as part of the retaliatory executions (Geiselmordpolitik) carried out by the Wehrmacht in response to acts of insurgency and sabotage, the Jewish women and children were ordered to pack their personal belongings and report to the head office of the Judenreferat, the Jewish Section of the Special Police at no.23 George Washington Street. After handing in the keys to their properties, around 5,000 or so Jewish women and children were taken to the adapted Pavillion no. 3 at the newly established Judenlager Semlin. Although families of the leadership of the Jewish Representative Body were not obliged to comply with this order, Hilda defied her parents' wishes, and volunteered to go to the camp to continue to perform nursing duties among, as she put it, the 'people in need'. The first letter by Hilda Dajč was written on 7th December 1941, the day before she left for Sajmište. The recipient of this letter was Nada Novak, Hilda's friend from High School. Nada, who was two years older, used to be president of the school's Literary Society which is where the two girls met. In the letter Hilda refers to the time at school and 'The Society' as the 'most pleasant period of [her] life'. The second letter was written two days later, on 9th December, and contains the first impressions of life at the camp. It was addressed to Mirjana Petrović, another school friend, who wrote to Hilda a day earlier. the letters were smuggled in and out of Sajmište by the Jewish hospital staff, who regularly visited the camp. The third letter, to Nada Novak, is said to have been written around the 13th December. In it Hilda reveals that members of the family are about to join her at the camp. Clearly, once all the Jews had been interned at Sajmište, The Nazis no longer had any use for the Representative Body of the Jewish Community or its leadership. In the period between the third and the fourth letter, Mirjana Petrović met Hilda on several occasions, once together with Nada Novak. During the harsh winter of 1941/1942 the river Sava froze over, and every day, small groups of interns carrying stretchers with the dead and the seriously ill, could be seen walking across the ice under German guard. On the docks opposite the camp, they were met by the staff from the Jewish Hospital who unloaded the casualties onto a truck. On one occasion, Hilda managed to summon Mirjana to a small run-down inn frequented by dock workers, where the interns who carried the stretchers were allowed a brief rest before returning to the camp. The two friends embraced and spoke briefly. They met on two further occasions, but during their last encounter the guard did not allow them to talk. Mirjana Petrović later recounted that by that time Hilda was thin, pale, and seemed dejected and desperate . This is evident from the tone of Hilda's last preserved letter from Sajmište, written in early February 1942. The date of Hilda Dajč's death is not known, although it is certain that she was killed along with over 6,000 Jewish women, children and elderly in a mobile gas van which was brought to the Semlin Judenlager in March 1942. Between late March and 10 May 1942, interns were taken, in groups of between 50 and 100, on their last journey to the burial grounds at Jajinci. This spelling of the surname which was used by the Dajč family is the Serbian transliteration of the name Deitch. These details were recounted in a letter which Mirjana Petrović sent to the journalist and publicist Jaša Almuli in 1989. See Almuli, Jaša, Jevrejke govore, Beograd: Signature, 2005, p. 132-133.